Specification and sizes of the mini twister. Plug and play system Ergonomic carry handle. System Features Apprx Filter size : 19 x 19 x 2 (LxWxD) in CM. Noise 68 db. Product Information. View all categories. Appareil de bronzage par brumisation. vous acheter le compresseur avec ces 2 pistolets (pas d autres accessoires ). Condition: New with MaxiMist Warranty. 1 count MaxiMist Xena Spray Head / Applicator only. Compatible with the MaxiMist Allure Xena only. Will not fit other units. (see system examples pictured). Model: 0800B Xena. All spray unit parts fit into the mobile carry case! Condition: New with MaxiMist Warranty. Compatible with the Maximist Allure Xena Sprayguns. Model: 0800B Xena. One sprayer handle only (spray unit, gun and cup is not included). Airbrush Tanning Solutions DHA. 1 x Tanning Machine Spray Gun. Suitable for tanning machine. Item Type: Tanning Machine Tube. 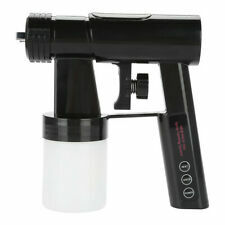 Made of high quality plastic material, the spray tan gun is durable. The spray gun sprays water evenly to skin.